Last year I put together a list of "10 Picture Books About Sharks" for Shark Week 2015, and I decided to see if I could come up with a few more this year. This year's list also includes some non-fiction picture books and a poetry book. If you know of any good ones that I've overlooked, please add them in the comments! Discovery Shark Week and National Geographic's SharkFest start June 26. 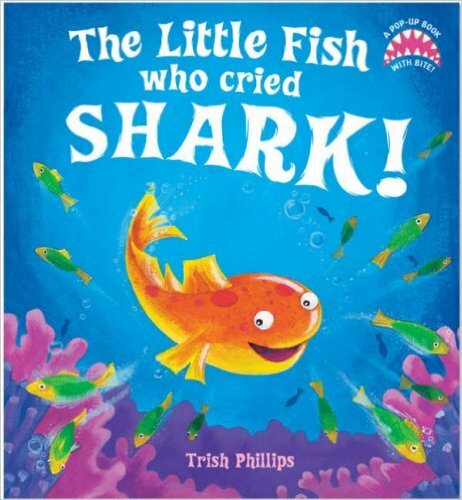 The Little Fish Who Cried Shark! by Trish Phillips. August 25, 2009. Little Tiger Press. 16 pages. Ages 3-6. Naughty Sprat is a little fish who likes to scare everyone else by yelling "Shark!" He thinks it is so funny to watch them all scramble to hide, when there's really no shark around. Or is there? This is a great pop-up book that is obviously a re-telling of the folk tale, The Boy Who Cried Wolf. Unfortunately, it is out-of-print and hard to find, but if you can get your hands on a copy in good condition, it's a great book for younger kids. Shark In The Dark! by Nick Sharratt. September 3, 2009. David Fickling Books. 24 pages. Ages 4-8. In this lesser-known "fin-tastic" sequel to Shark In The Park, young Timothy Pope is looking out into the night with his telescope. He thinks he sees a shark, but it always turns out to be something else. Like the first book, this one would be great for storytime as the kids can guess whether what Timmy sees is a shark or not, and if not, what might it be? I like that he is actually looking out to sea in this book, but some of the phrasing seems a little awkward to me. Bored! Bored Bored! by Jill Newton. July 5, 2002. Bloomsbury USA Childrens. 32 pages. Ages 4-8. Claude the shark is bored, bored, bored! The other sea creatures invite him to help with the community garden, but he is not interested in raking, planting, pruning, or watering. After all the work is done, there is a party for all those who helped in the garden, and Claude feels left out. Then he has an idea of how he can contribute, and discovers something he enjoys doing. Children can easily related to feeling bored and having a hard time finding something they want to do, and what parent hasn't heard the whiny refrain "I'm so bored!"? The illustrations are bright and colorful, and children can try to name the different sea creatures depicted. This is a good story for sparking a discussion about the importance of everyone pitching in and working together. 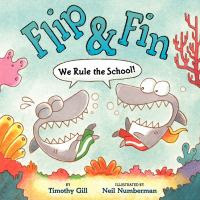 Flip & Fin: We Rule the School by Timothy Gill, illustrated by Neil Numberman. April 22, 2014. Greenwillow Books. 32 pages. Ages 4-8. Flip and Fin are sand shark twins. Flip loves telling jokes, and is getting ready for Joke Day at school. He practices and practices, trying out all kinds of jokes. But when the day comes, he begins to get nervous and freezes on stage. But luckily Fin is there to help him out. This is a silly book, full of corny jokes and bad puns, with cute and colorful illustrations. It's a little long and the humor a little too sophisticated for most preschoolers, but would be great for kindergarten storytime and younger school-aged kids, especially those who are going through the joke-telling phase. 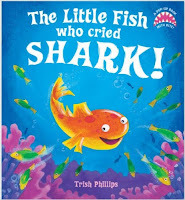 There is also a page at the end with a few interesting facts about sand sharks and some of the other sea creatures in the story. Shark Detective! by Jessica Olien. September 1 2015. Balzer + Bray. 32 pages. Ages 4-8. 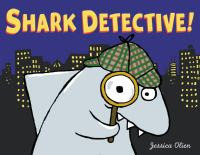 Shark lives in the big city and dreams of being a detective. One day he notices a missing cat poster, and decides this is his big chance. It does not go well at first, and he almost gives up, but in the end he "finds his man", which leads to another mystery and new friends. Fans of Rachel Bright's Love Monster will likely enjoy this story as well, as they both show an unlikely hero searching for something and finding friendship when they least expect it, and both have bright, bold illustrations with heavy black outlines. It is also a good opportunity to talk about pursuing your dreams and not giving up, and I really like that is shows Shark beginning his investigation by first going to the library and doing research. This book is cute and a little bit funny and silly, and would likely work well in storytime with older preschoolers and younger school-aged children. 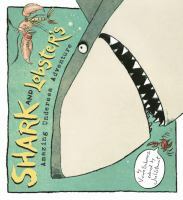 Shark and Lobster's Amazing Undersea Adventure by Viviane Schwarz, colored by Joel Stewart. May 9, 2006. Candlewick. 40 pages. Ages 3-7. This is not one of my favorites, and would probably not work well as a group read-aloud, but some kids would probably love it. It is not a traditional picture book, but is instead told in graphic novel format with panels and speech bubbles. It is a good story about facing your fears and learning not to be afraid. How To Spy On A Shark by Lori Haskins Houran, illustrated by Francisca Marquez. March 1, 2015. Albert Whitman & Company. 24 pages. Ages 4-7. This non-fiction picture book shows some of the steps involved in studying sharks, with very brief, short explanations just right for very young kids and early readers, with fairly realistic drawings. This book is the perfect level and amount of information for younger kids who are curious about sharks and how they are studied, but are easily overwhelmed with too many details. I like that the more detailed information is given at the end so that an adult can read and discuss it with the child(ren). This would be good for a beginning reader, or could work for a storytime to introduce some factual information. Hark! A Shark! by Bonnie Worth, illustrated by Aristedes Ruiz. January, 2013. Random House Books for Young Readers. 48 pages. Ages 4-8. This is part of The Cat In The Hat's Learning Library, a series of non-fiction books written in Seussian style. These books are educational AND entertaining. They are full of facts and information, but written with a rhyme and rhythm inspired by Dr. Seuss that is fun to read and listen to. I highly recommend this series! They are a little on the longer side, so better for kids with longer attention spans, but the rhyming text does help keep them engaged. 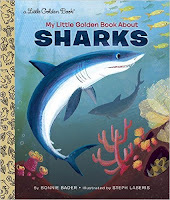 My Little Golden Book About Sharks by Bonnie Bader, illustrated by Steph Laberis. June 28, 2016. Golden Books. 24 pages. Ages 2-5. This is another non-fiction picture book that will be released this year during Shark Week. Children will appreciate the bright, realistic illustrations and enjoy learning factual information about sharks. Little Golden Books typically are too small and have too much text for storytime, but are great for one-on-one or independent reading. 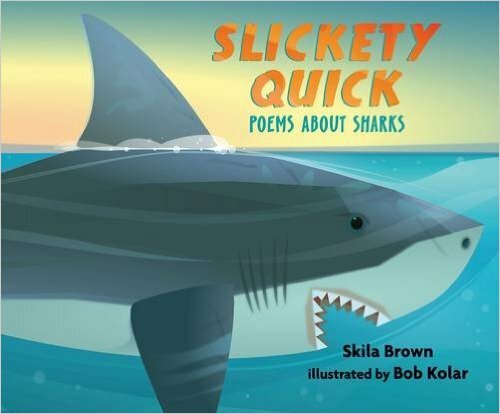 Slickety Quick - Poems About Sharks by Skila Brown, illustrated by Bob Kolar. March 8, 2016. Candlewick. 32 pages. Ages 6-9. A book of poetry all about sharks! Fourteen different shark species are described in poems of various formats that are both fun and informational. The illustrations are clear and colorful, and just the right balance between cartoon-y and realistic for younger kids. I think this book would be a really fun way to introduce younger readers to poetry, providing the opportunity not only to learn about sharks, but also various types and formats of poems. Don't forget to check out my previous list for even more great shark stories! 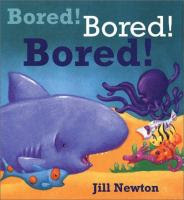 For more non-fiction books to learn about sharks, check your local library in the 597.3's. Thank you for this detailed list! So many of my students LOVE shark books. These will be some great additions to our collection. Glad you found it helpful, and thanks for stopping by! To receive updates to this blog via e-mail, enter your address below. I am a former education major turned microbiologist, turned SAHM-cake artist, turned librarian-in-training. I also coached a state champion middle school track team along the way and raised two kids, one in college and one in high school. 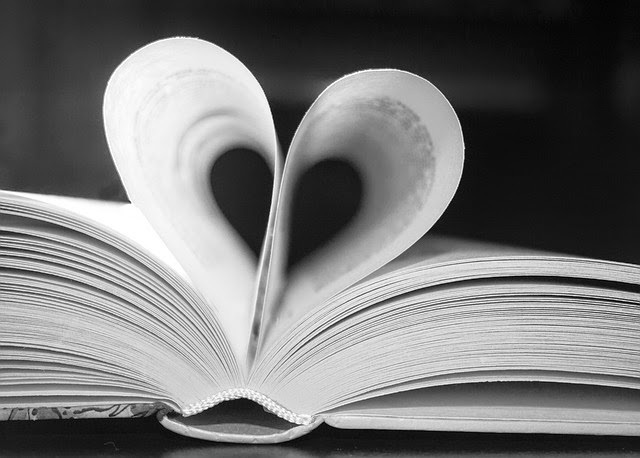 I am not a librarian (yet), but I do work in youth services at the library while working on my MLIS. "There are no failures, just lessons." - Pete the Cat . Watermark theme. Powered by Blogger.